The following is a cross-post from NFL.com, where we’ve recently launched a Football Freakonomics Project. Today’s question on “Football Freakonomics” is a tricky one. Which incentive is stronger for an NFL player: landing a big contract or winning the Super Bowl? It’s better, therefore, to measure actual behavior – in this case, for instance, how players perform before and after signing a big contract. Once he got his money locked up, the running back had a weaker incentive to perform well. The reason the running back got his new monster contract in the first place is that he was performing out of his mind – and was bound, therefore, to fall back to earth a bit. So the team made the same mistake that a lot of stock-market investors make: they bought high. And let’s not forget that the running back is now a year older, and running backs tend to not age gracefully. Burke also looked at the performance of running backs, quarterbacks, and wide receivers on Super Bowl-winning teams. Once again, he saw a drop-off from the Super Bowl season to the following season: .41 yards per attempt for quarterbacks; .43 yards per target for receivers; and more than half a yard per carry for running backs. Winning the ring was the main incentive and once that was accomplished, the player’s motivation fell. It’s hardly surprising to see such a steep fall because these players obviously had an aberrationally good season in order to win the Super Bowl in the first place. Truth be told, asking whether money or winning is a bigger motivation is almost a trick question, like asking what’s the better food – pizza or hamburgers. They’re both great! Getting paid and getting a ring are both profoundly strong incentives. It will, however, be interesting to watch how players are incentivized by big money now that big money is getting harder to come by. As the “Tilting the Wage Scale” section in the accompanying graphic makes clear, guaranteed contracts are shrinking mightily. The top three picks in the 2010 draft (Sam Bradford, Ndamukong Suh, and Gerald McCoy) each received an average of $41.7 million in guaranteed money. Then came the lockout, and a new deal between the owners and players. In 2011, the top three picks (Cam Newton, Von Miller, and Marcell Dareus) each received an average of just $21.1 million (or should I say “just”) in guaranteed money. So we’re at the beginning of a new era for cash incentives in the NFL. Which, theoretically, makes winning a Super Bowl even more valuable. Will we therefore witness a sea change in players’ motivations? Probably not. The fact is that we all constantly responding to private incentives and collective incentives. A football player wants to do well for himself and he wants his team to win. But private and collective incentives don’t always align. Consider the phenomenon of penalty kicks in soccer. Statistically, a kicker is most likely to succeed by kicking the ball down the center of the goal, since the keeper almost always jumps either left or right. So if a kicker truly wants his team to win, he’ll be more likely to choose the center. But that rarely happens. Why? Because if a kicker goes right or left and the keeper makes a great save, he can attribute his failure to the keeper’s great play. If he goes down the center and fails – well, he’ll be considered a fool for the rest of his days for even thinking about kicking the ball down the middle. So while we might think that he’s got the team’s incentive at the front of his mind, his private incentive – to not go down in history as a fool — is probably just a little bit stronger. What about looking at how how running backs performed the year before their contract year? It would be interesting to see if there is a consistent spike in performance right before another pay day. Probably not conclusive proof either way. Like all sports fans my heart would tell me winning the championship is the bigger motivator for a player, but my head is overruling me and saying its all about the contract for modern stars! I don't buy your argument about penalty kicks being influenced by incentives. When you take a penalty kick you have a choice of tactics. You can psych out the keeper to go the wrong way, or to move too early. You can do it with your eyes, body shape, run up. Or you can just ignore all that and concentrate on the kick as a purely technical exercise. If you strike the ball firmly and accurately into any of the four corners of the goal it's impossible for the keeper to save it. Players are quite rationally not concerned with statistics of success that apply to the whole population. All that matters is their individual technical expertise, and their own ability to handle the pressure of the situation. If they are confident in their ability it is rational to select the option that leaves them in control. Strike the ball properly towards a corner and it is a goal. Get into mind games, or aim down the middle and you are no longer in full control. You're dependent on the keeper getting it wrong. Of course footballers aren't always rational, but poor penalties are more often the result of poor performance under pressure rather than a perverse response to incentives. If they were motivated by incentives then the correct rational decision would be to let someone else take the penalty. The upside of scoring when you're expected to do so is very low. The downside of missing can be massive. The reward from someone else on the team scoring is the same as if you score. So why take the risk? It's not rational. But then applying rational analysis to incentives in sport seems a rather suspect exercise. "So if a kicker truly wants his team to win, he’ll be more likely to choose the center. But that rarely happens." If you had watched any soccer you would have seen that it in fact happens quite frequently. The big caveat is that you have to go at least 5 feet high or you hit diving goalies legs. Hitting the ball accurately in the right direction *and* at the right height is actually quite difficult. "If they were motivated by incentives then the correct rational decision would be to let someone else take the penalty"
This has been known to happen. On at least one occasion it was followed by a massive public criticism of the team by its coach for cowardice. "like asking what’s the better food – pizza or hamburgers. They’re both great!" I would think the best evidence of relative value of pay versus winning is how often a free agent takes the best paying contract with a poor team versus taking a somewhat less lucrative contract to play on a team with an excellent chance to make the playoffs. Of course the agent might have to take a pay cut too and they don't get a ring. Is there any way to get this info? Another important factor in the year following the super bowl victory is the schedule. Teams with better records have tougher schedules the following year. This could be evaluated by looking at the record differences of the opponents from year to year or maybe some measure of the defenses of the teams played in each year. There is also a common belief that all opponents get up for playing the defending super bowl champs. This one would be tougher to prove. Until a player has received his big contract, it is more about the money. They are typically younger and believe they have time to get the ring later. Once they get the big payday, the emphasis shifts to ones legacy. No superstar wants to retire without a ring. Many will play for less than they are worth to get the chance at a ring after they've collected on their massive contract. If you could poll rookies and receive pure honesty, I'll bet a majority of rookies would choose $10 mil in guaranteed career earnings and no ring over just $5 mil in guaranteed career earnings and a ring, even if $10 mil+ were still possible in non-guaranteed earnings. It would be a landslide. Simply look at how many outstanding players on contenders move to teams who are not contenders when the contract and signing bonus the non-contender can offer is larger. Why not consider regression to the mean? Very few players performing worse than their ability level earn multi-million dollar contracts. There's probably a similar bias for winning teams. If a team's featured running back is performing below his potential the team is less likely to win the Super Bowl. Super Bowl Champions for the most part will have a slew of players that had exceedingly good years. The "ring" as in Super Bowl Ring does matter. Guys know that is remembered for a life time ("Hey, is that a Super Bowl ring you are wearing?"). 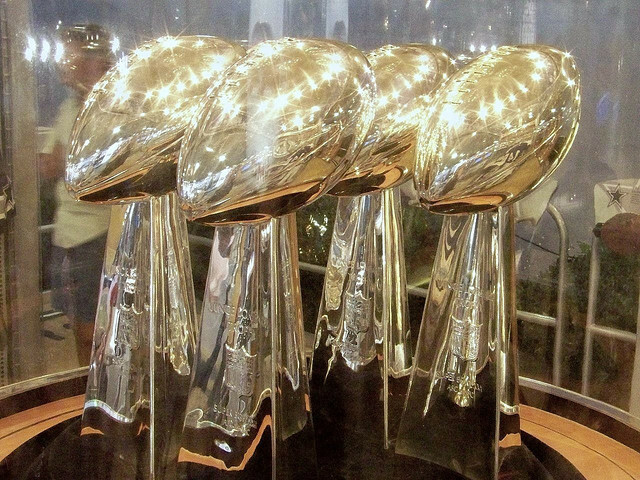 So while the big contract is obviously important, winning a Super Bowl is something all players want to participate in. In an interview with an ex-mlb player, he revealed that the first year after his big contract was inked, he felt an immense pressure to perform in a way representative of his paycheck. The second year into his contract, he began putting up numbers that were more indicative of his abilities. Just this year, Dan Uggla of the Atlanta Braves was playing horribly in his first year after being traded for. I can't recall the stats off the top of my head, but he had a handful of multi hit games (literally, less than 5) and almost no time did he get hits in back to back games. He was batting in the .100's, and then hit in 33 consecutive games with 32 RBI and 15 home runs. His turnaround was one of the most remarkable you'll ever witness, but it goes to show that players don't rest on their laurels just because they have the money. What player wants to be remembered as a bust? I didn't see kids wearing Leaf jerseys. When a player has a career year in a team sport - he has support from other players. A running back has good blocking - or a good passing game. His team is healthy and competent. Maybe his team has a good schedule. The following year things change. Maybe a blocker moved on. His schedule is tougher. He might be as good - but without having as supportive of a team, his stats don't show it. When it comes to games or sports like my own enterprise, there is only one incentive. Ideas have to be correct in order to accomplish anything of real value. so from my own standpoint, the debt that I owe to myself, to those scientists who came before me and to all who wish to advance their own sciences further is- to get it right from the start- which is what I am working on. Goldstein, 2012. No two words... may be used without the author's permission. PS. Today, I got a bit of help from the late, Cesaria Evora- her newest song sung with Lura. anyone one wishing to understand the human condition go hear. Moda Bo. Her depth of feeling for it... As my daughter would say OMG. Running backs drop down in performance after a big contract? Perhaps the big contract is to induce the high performer to stay with his current team or to sign on to a new team because the challange is anticpated to be greater (in other words the work is expected to be more difficult). Also -- compensation is not just for the stats. In the end, the owner needs to make a profit and high profile players help to sell tickets and improve broadcast contracts, etc. For the ownership -- the package of expenses and revenues interact on a broader range of variables. Looking at only the player may be a bit narrow. A player that comes to mind is Albert Haynesworth who is a defensive tackle. He signed with the Washington Redskins for an OBSCENE amount of money, like $100 million dollars. If you are not familiar with this player he has a long history of rough, constantly penalized play. He is the player who took his spikes and dragged it across helmetless Tenessee Titan player. Yep, that was him and that is apparently what $100 million dollars will get you. He has since been let go or traded (I can't remember) and landed with the Patriots with limited playing time. I think some of what was written does have some merit, but there are also other factors like age, compete level and quality level of team. First of all, in any pro sport the incentive to make money and win is always there, but when a player is younger, they tend to want the money and as much of it as possible. The want to win is always there, but if they aren't on a great team, money is king. It is only when a player gets older and hasn't had the chance to covet the championship that he will take a cut in pay to go to a better team to win, because ultimately, a player does not want to leave the game empty handed. They want to leave a legacy. There are MANY types of players. Ones you can count on day in and day out, those that are streaky..sometimes no points/yard for an extended period and other times a lot of production for a set period of time and back to no production and skilled players of various degrees. Those with a high-compete mentality will always want to win and want money as well, but will always sacrifice a better team as opposed to receiving a higher salary OR try to bring out the best in themselves and also the team they are with. When you look at these large contracts and the decrease in production, please show us how long they have been with the team and what teams they played for in the past, plus the years they played with each. If a player had high-production on a bad team, especially if he is one of the very few skilled players on that team, of course he will always have that opportunity to score more. Players have more faith if the more skilled player has the ball. This, the effort in a lot of cases is to get him the ball. The fact that he produces less the year after a championship OR little after signing a large contract MIGHT have to do with the quality of players on the team. If there are more skilled players on the team with him, he may receive less opportunities. From one year to the next be a result of injuries, game missed, new plays he is not able to adjust to, and a number of smaller and lesser possibilities. A person with a high compete level will always try to produce as much as possible because they are always testing themselves. A person without may fall into this decline category. A person will natural ability or isn't mentally strong and falls for the "easy" money route may also be De-incentivized to produce. It all comes down to personality and character of the player. One issue not considered here is the impact of the salary cap in a sport like football. When a player get a large contract that is a significant increase over the prior years, it means there is less to spend on other players. So while a running back makes more money, it is possible they cannot pay the offensive line who blocked for him or the receivers who kept the defenders from crowding the line of scrimmage as much. Similar to winning a Super Bowl, where free agents who had good years want more money to stay, impacting the rest of the team. A great example of this is the Chicago Blackhawks in hockey following their Stanley Cup victory a few years back. Due to incentives for two of their star players (they had bonuses that paid based on strong individual performance and the championship victory), the team was not able to re-sign other key parts of their team. « Previous PostCan Parking Direction Tell Us Anything About Company Morale?